Every young Indian leaving the homeland for the United States is given the following orders by their parents: Don’t eat any cow (It’s still sacred! ), don’t go out too much, save (and save, and save) your money, and most important, do not marry a foreigner. Priya Rao left India when she was twenty to study in the U.S., and she’s never been back. Now, seven years later, she’s out of excuses. She has to return and give her family the news: She’s engaged to Nick Collins, a kind, loving American man. It’s going to break their hearts. Returning to India is an overwhelming experience for Priya. When she was growing up, summer was all about mangoes—ripe, sweet mangoes, bursting with juices that dripped down your chin, hands, and neck. But after years away, she sweats as if she’s never been through an Indian summer before. Everything looks dirtier than she remembered. And things that used to seem natural (a buffalo strolling down a newly laid asphalt road, for example) now feel totally chaotic. But Priya’s relatives remain the same. Her mother and father insist that it’s time they arranged her marriage to a “nice Indian boy.” Her extended family talks of nothing but marriage—particularly the marriage of her uncle Anand, which still has them reeling. Not only did Anand marry a woman from another Indian state, but he also married for love. Happiness and love are not the point of her grandparents’ or her parents’ union. In her family’s rule book, duty is at the top of the list. Just as Priya begins to feel she can’t possibly tell her family that she’s engaged to an American, a secret is revealed that leaves her stunned and off-balance. Now she is forced to choose between the love of her family and Nick, the love of her life. As sharp and intoxicating as sugarcane juice bought fresh from a market cart, The Mango Season is a delightful trip into the heart and soul of both contemporary India and a woman on the edge of a profound life change. Buku Amulya Malladi yang udah gue baca baru Serving Crazy with Curry dan gue sangat suka dengan cara penuturan Amulya dan sentuhan gelap dalam novel tersebut. Penasaran dengan The Mango Season. Untuk yang mau ikutan Wishful Wednesday, langsung aja meluncur ke blognya Astrid di sini. 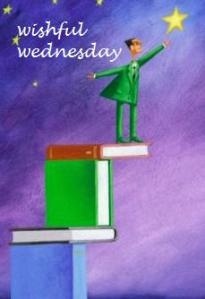 Happy Wednesday dan jangan lupa untuk membaca buku hari ini! Posted on May 22, 2013, in Uncategorized and tagged book, fiction, Indian Lit, Meme, Wishful wednesday, wishlist. Bookmark the permalink. 11 Comments. Iya, warnanya cenderung nge-peach. Banyak yang bagus kok karya penulis India.